Not to be confused with Flaptor or Floater. 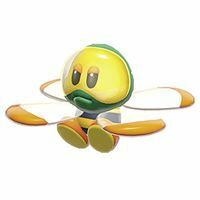 Flopters are bug-like enemies that appear in Super Mario 3D World. They have a bee-like body and four wings, and attack by ramming into the player. Their name is a combination of the words "fly" and "copter", describing their behavior. Flopters can be defeated by any attack and are usually found in groups. When undisturbed, they normally fly at a high altitude. Flopters make their first appearance in the level The Bullet Bill Express. Flopters have wings that spin around rapidly much like Twirlips and Choppahs. ↑ Shogakukan. 2015. Super Mario Bros. Hyakka: Nintendo Kōshiki Guidebook, Super Mario 3D World section, page 227. This page was last edited on April 14, 2019, at 19:22.